Italy is made up of 20 regions, each with distinctive characteristics. Here, you’ll get an overview of Trentino-Alto Adige to get you started on planning a Trentino-Alto Adige trip. One of the border regions with the most obvious signs of once having been ruled by another country is Trentino-Alto Adige. Look no further than the region’s other moniker, Trentino-Südtirol, to see the Germanic influence. Italy is a relatively new concept, unified only in the mid-19th century, but Trentino-Alto Adige didn’t become part of Italy until 1919. Prior to that, it was part of the Austro-Hungarian Empire. Today, you’re as likely to hear German in parts of this mountainous region as you are to hear Italian. Trentino-Alto Adige has some complicated name stuff going on. The Italian name is Trentino-Alto Adige, though it’s run like two separate mini-regions – Trentino and Südtirol – so you may see it called Trentino-Südtirol or (in English) Trentino-South Tyrol. The official Italian name is pronounced tren|TEE|noh AL|toh AH|dee|jay. The demonym for people or things from Trentino-Alto Adige varies depending on what part of the region they’re from. 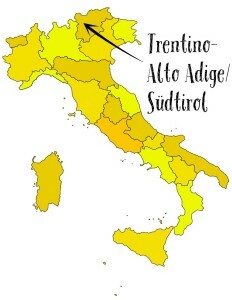 The demonym in Trentino is trentino (masculine singular), trentina (feminine singular), trentini (masculine plural), or trentine (feminine plural). The demonym in Alto Adige is sudtirolese (singular) or sudtirolesi (plural). The capital of Trentino-Alto Adige is Trento. Trentino-Alto Adige is in northern Italy and shares borders with the regions of Lombardy and Veneto, as well as the nations of Austria and Switzerland. It’s one of Italy’s five autonomous regions. There are no UNESCO World Heritage Sites in Trentino-Alto Adige. The vast majority of the terrain in Trentino-Alto Adige is mountainous – this is Dolomites and Alps country – and much of it is covered by dense forests. It’s a sparsely-populated region, largely agricultural (the apples here are famous), and a great destination for skiers. Trentino-Alto Adige is dotted with Alpine towns that would be at home in any Swiss or German postcard. The cuisine betrays a heavy Germanic influence. Some say things are a bit more orderly than in much of the rest of Italy. In some ways, Trentino-Alto Adige is a bit of a vacation from Italy without leaving the country. In addition to the giant mountains that lure skiers and snowboarders, there are also spa towns fed by natural hot springs that have been providing treatment for all sorts of ailments for centuries. One of Italy’s popular lakes, Lake Garda, is partly in Trentino-Alto Adige. The landscape of Trentino-Alto Adige makes it pretty challenging to get around here without a car, so once you’ve made it to one of the region’s big cities consider renting a car to really see the best the region has to offer. This is especially true if you really want to get up into the mountains.